Making maple syrup on an industrial scale is a complicated and expensive effort. Most people who have the ambition may not realize the work that is involved for the process. 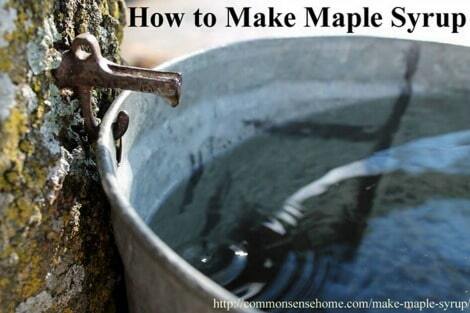 However, you can easily make your own syrup at home if you have access to maple trees. The only thing you need is the knowledge to achieve the best results. The first thing to realize about making maple syrup is finding the right trees. You will need maple trees that can produce the sap used to convert into a syrup. Maple trees need to be the right size to collect an ideal amount of sap. Another important factor is the location of the trees and the temperature. Northern areas that experience cold winters is the best location to make maple syrup. Maple trees need to be in areas that drop below freezing during the night and are above freezing during the day. This is necessary to collect the sap from the trees. If you try to extract sap from a maple that is not in the right area, then your results may be disappointing. Once the weather warms and trees start to bud, then sap will not have the sugar required to make maple syrup. The basic tools you need to tap maple trees to make maple syrup can be found at local hardware stores and any home improvement store. One important piece of equipment is the spout. This is necessary for the sap to run out of the tree and into a bucket or other container. Boiling is the method used to convert the tree sap to maple syrup. This should be done outside as there is a residue that can be hard to clean in your kitchen. You also need to filter your syrup to remove the “sugar sand” that is present.